The chart below shows approximate gauge thickness for metal to give a relative idea of different gauges. It is in American Standard Gauge of thickness. The photos of gauge thickness on these charts is shown for comparison and may appear thicker or thinner than actual thickness on some screens. We are a working studio. As metal crafters ourselves for the last 27 years, we know how good materials & tools can produce excellent results. Please check out the metal craft information link below. 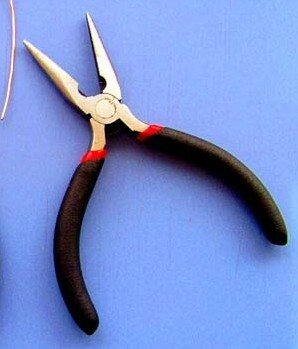 6.54 mm VERY HEAVY THICK WIRE For large sculptures & armatures- cuts best with a bolt cutter or saw. Or see the inch dimensions in the chart lower on this page and compare with a ruler. *This chart shows approximate gauge thickness for metal to give a relative idea of different gauges. We urge ordering samples to see exact thickness and to get a feel of the metal. Nothing beats hands on experience. There are different standards of gauge measurements that vary from industry and country - this is the American Standard gauge system for non ferrous metals. 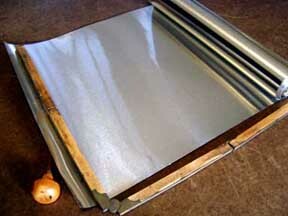 Thinner metal bends & cuts more easily in general than thicker of the same metal..
Sheet metal in 23 & 24 gauge is heavy - traditionally used for roofs and range hoods- where it will last hundreds of years. It weighs one pound per square foot approximately.It cuts with a tin snips or saw. Anything thicker in sheet is in the area of metal plate. 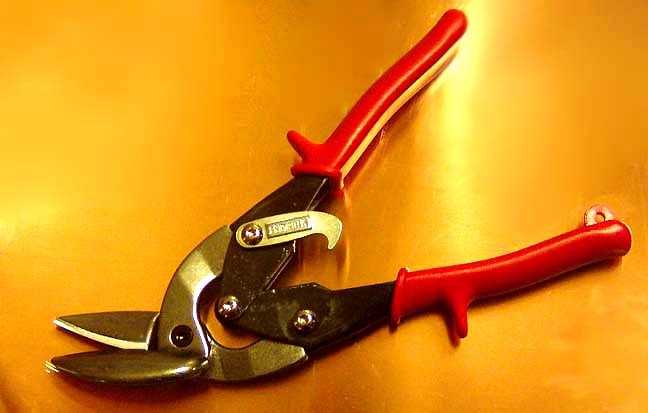 It is difficult to bend and can not be cut with tin snips. A cutting torch or saw is used for this. 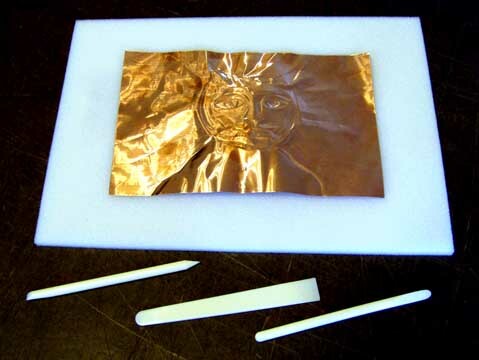 Medium weight sheet is 30 gauge easy to work and most cuts with a scissors. Light weight sheet , 36 to 38 gauge is a hefty foil. It cuts easily and is easiest to work. Thick wire from the thickest 2 gauge and the progressively thinner 4, 6 & 8 gauge are more difficult to bend and cut than thinner wire. In addition soft wire feels thinner than stiff wire in its handling as we innately associate thickness with stiffness. For the same reason comparing sheet metal may be misleading as the thickness may be the same but the stiffness is different. The gauges are AWG average wire gauge which means they are approximate and vary slightly from length to length. But they would not vary by even a 1/2 gauge. For craft metal this is the best as scientific/ engineering gauged metal is much more expensive because of the cost of manufacturing metal with tolerances 1/1000 of an inch and finer. 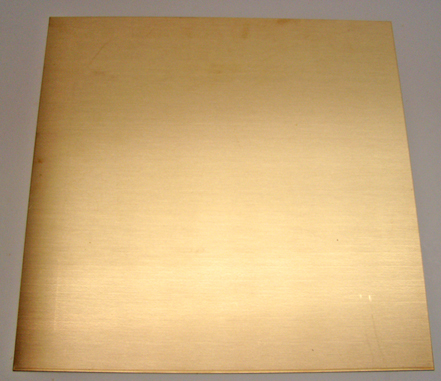 We ship our metals in a raw state- that is un coated with a bright brushed surface. Sculptures, Jewelry & Art are always made of raw metal and cleaned , polished and coated AFTERWARDS. Or they are textured, painted or patinated. Novices often expect metals in the raw state to have a finished surface and do not consider the marring that may occur with creation of a piece; nor consider that metal cannot be soldered, braised, or welded if there is any coating on the metal. 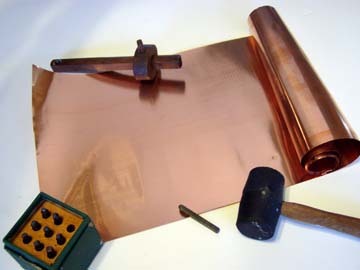 Metal suppliers are often vexed by expedient beginners expecting to be shipped mirror finish sheet and wire for crafting jewelry. The only metals commonly in use that do not tarnish are fine stainless steel, pure gold and platinum. We do not offer these due to difficulty of working with stainless steel and the cost of gold and platinum. This aside, copper, brass, nickel & aluminum will last a long time with some care. Objects of these metals thousands of years old grace museums. Unpacking Craft Metal orders: We handle craft metal with gloves so as to minimize finger prints and wrap to protect in shipment. When opening a wrapped piece be careful not to cut or scratch the craft metal. 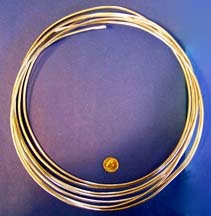 If it is a coiled item it may spring open slightly when tape is cut. Open packages carefully over a counter top & soft surface as metal may slip out and dent. Craft metal shipped in tubes usually slide out an open end very easily or with with slight tapping- care should be taken not to dent the metal in the process. 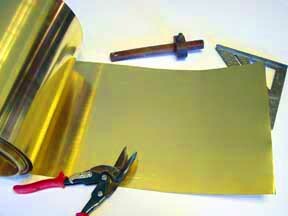 If it is difficult to remove, unwinding the cardboard tube will uncover the metal. 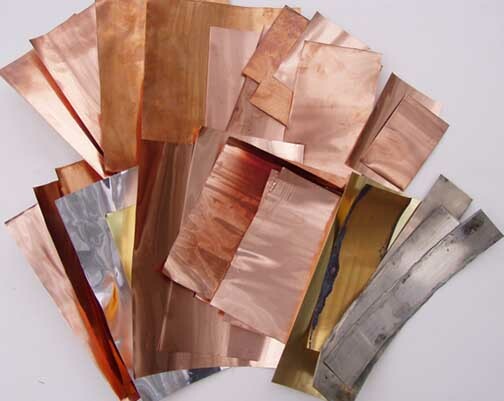 BULK METAL: Save with our cut to length bulk metal prices for the crafts person. Our cuts are generously long & approximately square. Metal by the running foot or yard is shipped in one length whenever possible. We use this metal to craft our own creations. Most metal is shipped in a roll. If necessary ripples or curves can be flattened by rolling it with a smooth rolling pin or plastic pipe section on a completely smooth surface such as a countertop or glass table. Our thinner gauges are shipped in a tube which works as a roller for smoothing too. GAUGE Is thickness. The higher the gauge number the thinner the metal. For example 23 gauge sheet metal is more than twice as thick as 30 gauge. See below for gauge charts. HARDNESS: Basically how easy it is to bend or work. Hardness has more to do with temper than thickness. 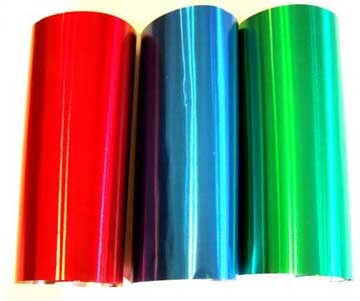 A very hard foil can be stiffer than a very soft sheet metal twice the thickness. 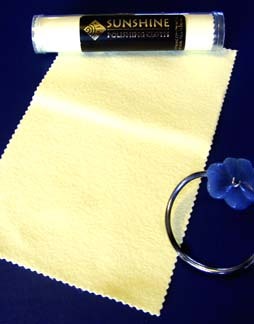 Medium Soft is pliable yet holds up for folding and hammering. Commercial mill grade: Metal as it comes from mill with a rolled satin finish. It has some very light manufacturing ripples, scratches & color variations. Our new metals can be buffed up to shiny satin finish with metal cleaners and a buffing pad. We recommend a powdered cleaner called "Barkeepers Friend" available in most grocery stores. 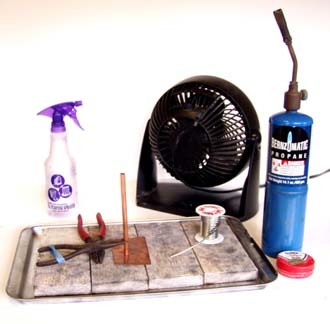 A paste wax or clear varnish can be used to keep metal bright. We also offer Reclaimed -Recycled metal: This unused older metal often develops character from being in storage for up to 75 years. It has color variations (patina) and may have scratches, finger prints, ripples and/or dents, but no holes. It is very usable at a good price. We find this metal too useful in our own creations to scrap. CAUTION :HANDLE WITH CARE , Raw metals have sharp edges. Rolls and coils are tightly wound and may spring open. They are not intended for young children . Gauge thickness shown is approximate.Our metals are sold only for craft work; and they are not tested nor certified safe for electrical nor electronic uses, nor home construction nor internal consumption. 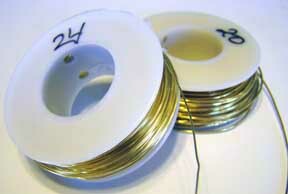 For other thicknesses of wire and sheet metal & dimensions in mm see the listings for individual metals.